Apple is set to begin mass production of the 4.7-inch display to be used in the iPhone 6 this May in preparation for the device's general release this fall, according to a new report from Reuters. Citing supply chain sources, the report also states that the much rumored 5.5-inch version of the iPhone could be delayed due to difficulties with in-cell production technology, and is likely to commence several months after the initial production of the 4.7-inch displays. A report last week from Japanese business newspaper Nikkei stated that the iPhone 6 could launch "as early as September", and will be offered in 4.7-inch and 5.5-inch display sizes. This contrasted a claim from UBS analyst Steve Milunovich, who also said that the 4.7-inch version of the iPhone 6 might be the only model to launch later this year, with a timeframe for the larger 5.5-inch version unclear. In addition to a larger display, Apple's next-generation iPhone will likely feature a durable, sapphire screen, and a thinner, bezel-free design in addition to expected camera and processor upgrades. Man, looks like this 4.7" screen is really happening. I know I'm in the minority but the current form factor is perfect. I actually think this is a better size. 5,5" would bring it too close to the ipad mini. I don't buy the stuff into the production issues at all on the larger model. This is typical Apple. With the 4.7" they catch the first wave of early adopters that want a larger screen. Then a few months later, they release the 5.5" version for another bump in sales. Anybody remember the 'white' iPhone 4S? Yeaaa it's going to be delayed, along with the full-size iPad, the TV, the Watch, OSX, Pro Apps, and everything else that'd be worth talking about. Delayed til Google & Samsung come out with it all first. Can't wait to see what this will actually look like. So far the renderings have all been incredibly boring. It is rumoured by MacRumors that the rumoured Apple larger phone that is rumoured to be in production, is now rumoured to be delayed even though it's very existence is only a rumour. I'm probably in the minority here, but i have no desire to have a bigger phone. Not to say they shouldn't make it for the folks that do want it, but i don't. I just don't want to be forced to carry a phablet in my pocket when its time to upgrade later this year. Honestly i think they look silly and provide little usefulness for the added size. Current form factor is fine with me. 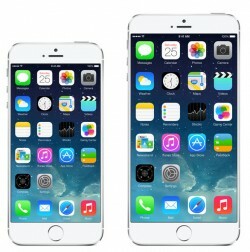 How bout the iPhone 6 comes in a 4" and a 4.7", both with identical processors and features? To me thats an ideal situation. Anybody remember the 'white' iPhone 4S? You mean the iPhone 4 - the white 4S was released on the same day as the black one.